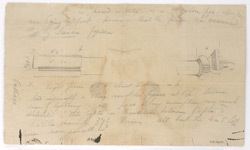 Pencil drawing by Frederick Charles Maisey of inscriptions and architectural details from Pathari, with notes, dated 1845 - 1852. The drawing depicts a column with a square base and a circular shaft, crowned with a round capital and an inverted stepped abacus that used to support a sculpture. The notes by the artist around the drawing mention that the figure was struck by lightning and that the inscription on the front of the shaft seem to be Late Gupta period.